worldwide excluding North, Central, & South America; available at CCA. For license inquiries regarding Laurel & Hardy motion pictures, complete one of our license inquiry forms. For more information, go to the Hal Roach Website. Click here to view or right-click here to download the complete list (pdf). Click here to order the complete catalog (pdf). Laurel and Hardy’s funniest moments are now available for licensing as 650 black and white video clips, about 30 seconds to three minutes in duration. Laurel and Hardy are the perfect cheer up for betweentimes. They are straight to the point and make you laugh within a few seconds. The clips are optimally suited for brief and flexible usage as well as for viewing on relatively small displays. The clips are categorized under aspects of possible exploitation such as advertising/sponsorship, e-cards or simply entertainment made for mobile. They are tagged with keywords referring to various subjects and occasions, like sports, weather, travelling, birthdays or Christmas. An online catalogue that provides browsing, searching, previewing and licensing content is available at catalogue.video-bar.com. Please note, the online catalogue is a B-2-B licensing platform, which is not available for personal use. Access is restricted to the Eastern Hemisphere (= the world minus the North, Central and South America). 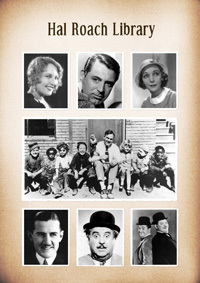 To inquire about licensing a clip or sponsoring a clip on the Laurel & Hardy website, click here.